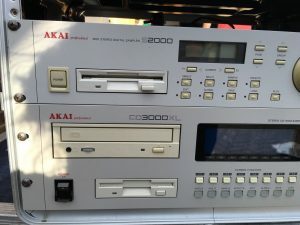 ” Verkaufe Sampler AKAI CD3000XL. Eingebaut ist optional eine Effekt-Erweiterung. Optisch sehr gut erhalten! Keine Kratzer Dellen o ä. Technisch 1A – alle Tasten, Regler und Beleuchtung funktionieren einwandfrei! Display i.O. War insg. nur ein halbes Jahr im Betrieb, danach 15 Jahre nicht mehr und war gut im Schrank aufgehoben. 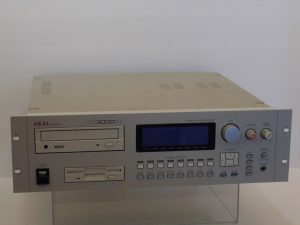 “Works perfectly apart from the cd drive.i have never been able to get it working Might be an easy fix.Cosmetically it’s in very good condition and loads floppy disks perfecty.Has the most recent os installed.The screen is not scratched but could do with a new backlight which is a bit dull but are available on Ebay for about £20. “Akai cd3000xl sampler fitted with 32mb ram providing 188 seconds stereo sampling time. “I have for auction a CD3000XL sampler which powers up but does not fully boot (may require removable system disk?) 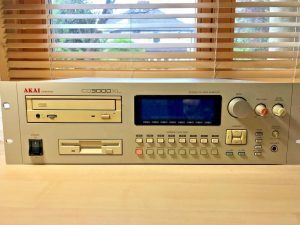 I am not an expert and am selling this as ‘untested’. You are welcome to come and test the equipment before buying. This is one of several Pro-Audio items that I am selling so please see my other studio/recording/sampling equipment as we are having a big clear out. There are the usual marks and scratches for used equipment of this age. All facias are clean and tidy.